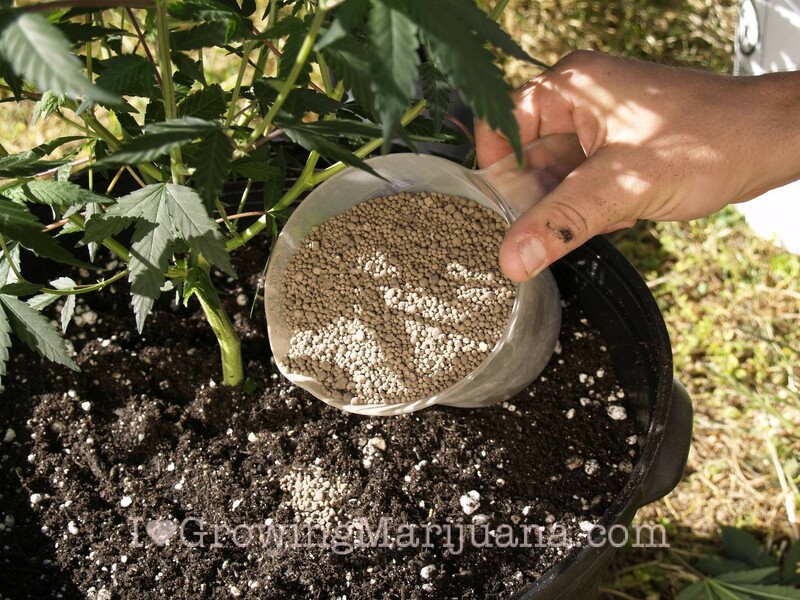 Ensure healthy and fast-growing plants by providing the right nutrients with a marijuana soil guide. Marijuana is a high-energy plant which grows quickly in fertile soil or a medium that is rich in available nutrients. Nutrients are found in the soil's parent materials: sand, clay, humus, minerals, rocks, and water are added to hydroponic solutions or soils using fertilizer. Nutrients dissolve in soil water (soil solution), which is then absorbed by the plant. In complex chemical processes, roots release ions in exchange for nutrients that are dissolved in the soil solution. These are the nutrients that gardeners are most likely to be concerned with, and which most fertilizers supply. Soils are likely to be deficient in one of these nutrients—especially nitrogen. In addition to the primary nutrients, the medium supplies plants with three secondary nutrients, Ca (calcium), Mg (magnesium), and S (sulfur), and seven micronutrients: iron, boron, chlorine, manganese, copper, zinc, and molybdenum. If P is available, young plants absorb it rapidly, and may soak up 50 percent of their lifetime intake by the time they are only 25 percent of their adult size. Young plants grown outdoors in cold weather may grow slowly until the soil warms up and more P is available. Potassium: K Is found in adequate quantities in most soils which have a pH within the range needed for growing marijuana. K influences many plant processes, including photosynthesis, respiration, protein synthesis, and the uptake of nutrients. Just as with P, K uptake is highest during the earliest growth stages. K is associated with sturdy stems and resistance to disease in plants. Most clays and soils that are well-limed have adequate reserves of K. Acidic soils generally have low K reserves. Mucks, silts, and peats have low reserves of K, and have little capacity to hold it chemically when it is applied. Sands have K reserves, but little capacity to convert it to a fixed or available form. Most Western soils have adequate reserves of K.
Magnesium (Mg), calcium (Ca), and sulfur (S) are usually found in adequate quantities in soils suitable for growing marijuana. However, some New England and Western soils do have MG deficiencies. Soils which have a neutral or near neutral pH almost always have adequate Ca and sulfur levels. Nitrogen: The availability of N is the factor most likely to limit the growth of marijuana. For fast healthy growth, marijuana requires a soil rich in available N. Nitrogen is constantly being replaced in the soil solution by microbial breakdown of organic matter. Some microorganisms can use N directly from the atmosphere. They release N as waste in the form NO 3, which is the primary form in which plants absorb N.
Cannabis is a nitrophile—a lover of nitrogen. Given ample N, cannabis will outgrow practically any plant. Ample nitrogen is associated with fast, lush growth, and the plant requires a steady supply of nitrogen throughout its life. Marijuana's requirements for N are highest during the vegetative growth stages. Phosphorus: P is an important nutrient which is used directly by the soil bacteria as well as by the plant, so that an increase in the amount of P in the soil often results in an increase of N. Because of P's low solubility, it is rarely leached from the soil. Cannabis takes up large amounts of P during germination and seedling stages. During flowering and seed setting, cannabis' need for phosphorus may also be high. If you look at any fertilizer package, you will note three numbers. They stand for N-P-K—always in that order. Marijuanas does best in a soil which supplies high amounts of N and medium amounts of P and K.
To grow to a large size, marijuana requires a steady supply of nutrients. These can be added to the soil before planting, or anytime during growth. Bulk fertilizers are added while the soil is mixed. These include manures, composts, humus, and concentrated fertilizers, such as rose food. Once the plants are growing, never condition or mulch indoor soils with bulk fertilizers. They promote molds and fungi, and attract other pests to the garden. Concentrated fertilizers can damage the plants if they come in direct contact with the stem or roots. While the plants are growing, nutrients are given in solution. They are dissolved in water, and the plants are watered as usual. Soluble fertilizers can be either organic or inorganic (chemical), and come in a wide range of concentrations and proportions of nutrients. Two organic fertilizers are liquid manure (about 1.5-1.0-1.5) and fish emulsion (about 5-1-1). Chemical fertilizers commonly have 20-20-20 or 5-10-5, or may contain only one nutrient, such as 16-0-0. A 10-5-5 fertilizer is 20 percent soluble nutrients and 80 percent inert ingredients. A 30-10-10 has 50 percent available nutrients and 50 percent inert ingredients. There is approximately the same amount of N in one ounce of 30-10-10 as in three ounces of 10-5-5. Actually, you can use almost any fertilizer, but the nitrogen content should be proportionately high, and there should be some P and K also present. For example, a 20-20-20 would work fine, as would a 12-6-6 or a 3-4-3, but not a 2-10-10 or a 5-10-0. How much fertilizer to use and how often to fertilize depend primarily on the fertility of the soil or the size of the container relative to the size of the plant. Small plants in large pots usually do not need to be fertilized. Even in small pots, most plants do not need to be fertilized for at least the first month. As the plants grow, they take nutrients from the soil, and these must be replaced to maintain vigorous growth. During the vegetative stage, even plants in large pots generally require some fertilizing—particularly with N.
The rate of growth of indoor plants is usually limited by the amount of light and space (once adequate nutrients are supplied). At this point, an increase in nutrients will not increase growth. Fertilizers designed for home use have instructions for fertilizing houseplants. Marijuana is not a houseplant, and it requires more nutrients than houseplants. The extra nutrients that it needs may be supplied by the use of large pots and a fertile soil mixture. In many cases, you will need to fertilize only in the dosages recommended on fertilizer packages for houseplants. For instance, Miracle Grow (15-35-15) is popular among marijuana growers; use one tablespoon per gallon of water every two weeks. A typical program for fertilizing might be to fertilize during the fifth week of growth and every two weeks thereafter until flowering. Then discontinue fertilizing (or give at one-half concentration) unless the plants show a definite need for nutrients. It is better to fertilize with a more diluted solution more often than to give concentrated doses at longer intervals. Make sure that a fertilizer is completely dissolved in the water before you apply it. Never fertilize a dry soil or dry soilless medium. If the medium is dry, first water with about one-half quart of plain water per pot. Let the pots sit for about 15 minutes so that the water is evenly dispersed in the pot. Then fertilize as usual. Because they are grown in a relatively small area, it is easy to over-fertilize indoor plants. When plants are vigorous, look healthy, and are growing steadily, don’t be anxious to fertilize—particularly if you have already fertilized several times with soluble fertilizers. Slow growth or symptoms of deficiencies clearly indicate the need for fertilizing.